Here’s a classic everyone has heard of, but I only watched it a few days ago. It’s a very emotional film. Knowing that, I steeled myself against the tragedy I knew was coming, which was probably the wrong way to watch the film. Instead of riding the emotional rollercoaster, you might say I watched the ride sitting on a bench somewhere with a soft drink. The result was that I examined the tragic flaws of our hero rather than grieved over the tragedy of the orphans’ plight. My focus was on why they suffered instead of the how they suffered. In the case of firebombing the Germans and the Japanese in WWII, I can never reconcile myself to the legitimacy of this form of warfare. With the nuclear bombs, one can legitimately claim destroying industrial parks and dockyards as the main objective, while terrorizing the enemy into surrender as the secondary objective. Incendiary bombs, especially of the sort used in WWII, have no effect on factories built with steel and cement. Firebombs work much better against wooden houses–especially houses of Japanese design. When it comes to firebombing, terrorizing the enemy is still the secondary objective, but destroying civilian homes and killing non-combatants becomes the primary objective. 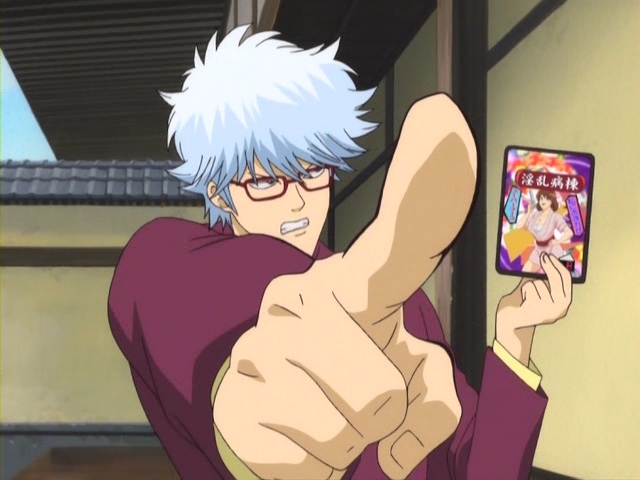 Gintama happens to be one of my favorite shows presently. 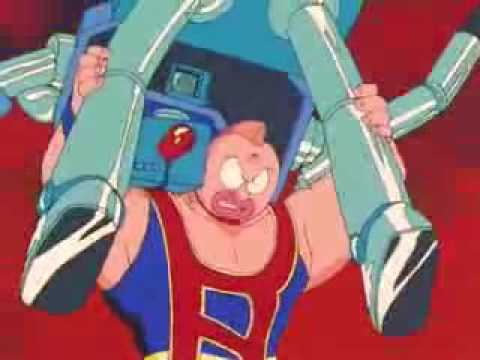 I always loved it for its outrageous humor, and its first two episodes are classic. In the second season, they started creating more serious story arcs, and they succeeded in making them spectacular. I suppose that the best comedies always have a vein of seriousness in it. Socrates did argue with Aristophanes in his Symposium that a writer of comedy should be equally able to write tragedy. Somehow, the seriousness of a situation always lends more humor to it. For example, while I was a cadet in the Navy League, my funny bone was surprisingly easy to tickle–but, my laughter often provoked unfortunate consequences, which very misfortunes actually led to a vicious cycle of joviality. At any rate, one of my favorite arcs deals with the show’s madao, Hasegawa Taizou. 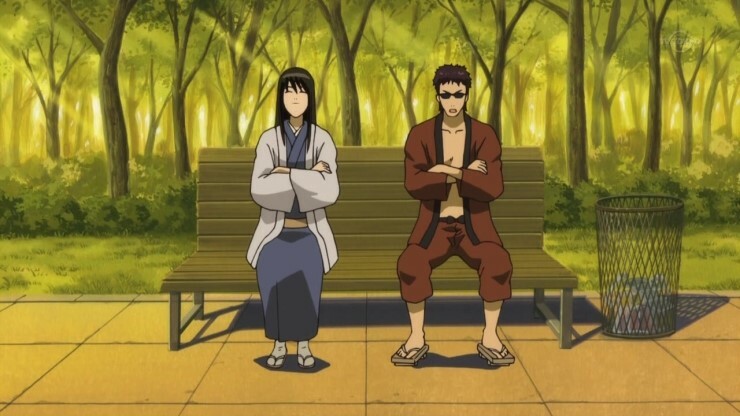 Madao stands for mattaku dame na otoko, which translates to “completely useless guy.” He finally gets a job by which he hopes to be able to repair his relationship with his wife, with whom he is separated. However, he discovers that his wife has begun to date another man. Refusing to let this ruin his good spirits, he goes to work by train only to have the following mishap: he trips on the platform, grabs onto a woman in the attempt to stop his fall, ends up dragging her off, and performs the start of an awkward wrestling move on her. This mishap leads to him being arrested as a pervert. To make his depression worse, the prosecutor happens to be the man dating his wife. This man offers Hasegawa a chance to have these charges dropped if he signs a letter of divorce. While Hasegawa refuses this, he does ask Gintoki, the series’ hero, during an interview at the prison for a rope strong enough to hang a man. 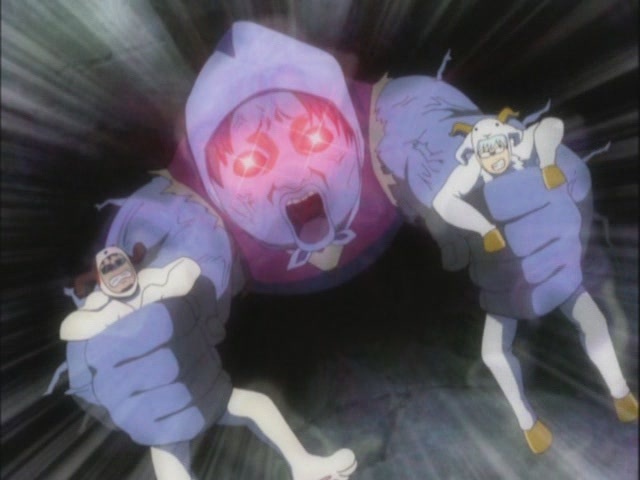 To which Gintoki respond with one of the noblest lines in the series: “Next time…I’ll bring the rope. I won’t bring it so that you can hang yourself, but if its a rope to pull you out of the depths of hell, I’ll bring as many as you need.” From this point, Gintoki becomes Hasegawa’s defense attorney, and one of the most screwball trials ever contemplated ensues. But, refusing to surrender to despair stands as one of the central themes in Gintama. They also crafted a magnificant story in the case of Hijikata, a the vice captain of the Shinsengumi, who takes a demon sword as a temporary replacement only to have it bring him under the curse of extreme otakufication. But, the series shows that there is always hope no matter what one is struggling against.